To tell the story of Krink, the worldâ€™s quickest growing art supply line, you need to hear the story of KR, an entrepreneur who learned everything the hard way. KR grew up in Queens in the â€˜80s surrounded by graffiti writers, skaters, punks and B-boys. Graffiti was a part of the attitude as much as it was the landscape. Everything was very DIY: steal paint, illegal spots, make markers, emphasize your style, experiment with multiple tools and methods. A lot of it was also based in economy (or lack thereof): sharing and stealing were simply a necessary part of the creative process. In the late â€˜80s, graffiti on trains died and the art spilled out onto the streets and highways. Writers became more mobile and so styles and tools changed accordingly. Homemade markers that had been the norm were too messy to carry and homemade inks faded in the sun. Pilot-brand silver paint markers became the tool of the trade yet in many ways couldnâ€™t meet this new generation of artistâ€™s very specific needs. In the early â€˜90s KR moved to San Francisco. The scene he found there was thriving, yet different. Most writing took place in parking lots and specified spots. He arrived with a whole different attitude regarding materials and styles. Ignoring designated areas, he used the streets of SF as his very own research and development lab, experimenting with a lot of different tools and techniques to create bigger, drippy marker tags. He also began making his own inks, allowing him to get up bigger, bolder and, now armed with an endless supply of ink, much, much more. From these trials and errors, KRâ€™s ink, or Krink, was created. He shared his concoction with a few friends and soon itâ€™s silver markings dominated the city. In 1998 KR returned to NY and brought Krink back with him. Before long, itâ€™s signature style was covering the streets of NY as well. This was around the same time writers began realizing they didnâ€™t need to trade in their lifestyle in order to make a living. The Alife store had just opened and was quickly becoming a mecca for young artists. They told KR that if he would bottle and sell Krink, people would buy it and they offered to help: it was more of a creative project than a business plan, something to work on collaboratively. It sold and people liked it and it just kept growing from there. Fast-forward to today and Krink products are shipping daily from a headquarters in Brooklyn to everywhere from CA to Moscow to Tokyo. The product line has grown to offer a number of different markers and inks that are unique to the market in their style, history and quality. And when the collaboration feels right, Krink continues to create limited-edition products with like-minded companies like Nike, Casio and Coach. The trademark paint drip aesthetic has found its way into art and design becoming a standard for street-inspired artists on a global level. 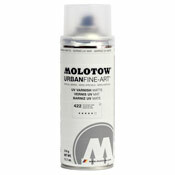 Itâ€™s been 15 years and what started as a product created to fit the specific needs of graffiti writers has grown into a product line with a range of creative tools for creative thinkers. 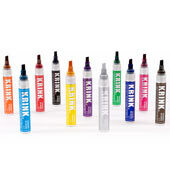 Watch closely over the next 15 as Krink continues to build its name as the premier art supply line for a new generation of artists.